ersatz esoterica – child of earlier times; spontaneous and intermittent; archaist, genre enthusiast, teacher of English. This is something I’ve been doing off & on for a while, but realised it would be worth formalising the concept. I would like to offer my services consulting on interactive & genre narratives. Whether you’ve got an RPG adventure you’re running or a ruleset you’re writing, whether you’re writing a horror novella or a sci-fi play, I could help you eke out the greatest narrative resonance from your story. Well, I’m not actually a clown. But I am a magician. That means I spend a lot of time thinking about what each audience might expect and how to achieve & manipulate that. It means I’m used to thinking about objects & the interactions between them in different ways. No-one thinks about cards like a magician does. I’m a writer: primarily speculative fiction, like cyberpunk or noir. I like building from and subverting genre expectations. I’ve written about the similarities between roleplaying and medieval oral culture. I’m an interactive narrative & games designer, from building silly games to modules for published systems. I’ve consulted with mindreaders about card games for oracle cards, written specialist GM advice for indie behemoths and spoken on villainy & antagonism at a monthly videogames conference. I can solve problems you have with interactive or static narratives. I can help you understand the core conflict within your narrative. I can highlight & clarify the emotions your game mechanics will promote. I can simplify & refine unwieldy systems or stories. I like players & characters to have agency – the ability to visualise & enact narrative consequence. I like brevity & clarity. I like people to be social & to promote their ability to tell stories. I’m taking a leaf out of the book of someone I greatly admire. My standard initial consultation fee is the price of a cup of caffeine. Buy me a coffee & we’ll talk through your needs. If you envisage needing a longer conversation, you can buy me lunch. If you’re in a different country, we can do PayPal & Skype. From there onwards, we can arrange further services according to your needs. But for many people, that little nugget of insight will be all you’ll need. Email me today at SEAN at BOOKSEANSMITH dot CO dot UK & we can arrange a coffee. For when you don’t feel like tracking the constant geo-location of your players. This system works for hex-crawls, urban exploration, or abstracted subterranean movement. This system is designed to allow the orienteer to push their luck and risk running the group into trouble. Note: in my game, I use a small packet of cards called the meat deck. It is constructed from the two to eight of each suit from a regular pack of playing cards, along with one of the jokers. If you don’t want to use a meat deck, gather a pool of at least eight d8 of at least three different colours: note which colour represents spades (threats) and which represents diamonds (discoveries). Each day is split into three watches of eight hours each. Each watch is split into a variable number of reaches determined by the orienteer’s skill and the luck of the draw. Keep the cards that have been selected for each reach separate from the discard pile. If the total number of hours combined from all reaches exceeds eight, the party will recognise that they have become lost at the end of that reach. Becoming lost ends the watch. Once the watch is over and any encounter has been resolved, shuffle all of the cards back into the meat deck. What if we want to work together? If the orienteer wants to take useful advice from her peers, she may make a Charisma save (made one step more difficult for each PC she wishes to consult). If this is successful, she may add each PCs Intelligence modifier to her own when drawing cards each reach during this watch. If this is unsuccessful, she forfeits her own Intelligence modifier for this watch. This system assumes PCs travel overland at an average of three miles per hour, working with six mile hexes. For urban or underground exploration, instead set watches to two hours total, made of eight 15m turns. Horror is a remarkably difficult emotion to bring about organically. Games and improvised narratives especially tend towards the easier to promote terror when attempting to develop fright. What follows is a tool you can use to create horrific images on the fly. Choose one aspect of that image / idea. For example, a lightbulb could offer its luminescence, its filament, its transparency. Select a part of something else to be used in the narrative. For example, glance at the nearest person; settle on the first limb / feature you spot. Grant the feature from the random oracle to the aspect of the desired element. For example, the nails on someone’s hand might be glassy and transparent; their breath gives off a faint glow in the shadow of the glade. Rather than a circle, one pupil looks like a keyhole. It takes a great deal of effort to stop looking at the corpse’s face, almost as if it were magnetic to sight. From its palm grows a single reed, though this vanishes when the arm is moved. It was as if the palm itself was a crossing to the pond where it was found. Does a guild of thieves sound too trite for your campaign? In Barnsleigh, the thieves have unionised. Adna Fairfield is keen for all thieves in the town to be members of the union. As far as she knows she’s got most of them, but she needs to check. Break into the town constabulary and steal their records. The Mayor has recently been criticised by town councillors and religious demagogues, so she’s keen to make some strong political decisions. Bluff your way into the Princes’ ball and convince the Mayor to raise tax on home security measures. Some of the union’s best workers have been out of business for months following falls from upper windows. Find a way to influence building regulations to lower overheads. Being part of a union means protected sickness pay. Break into the home of Suren Parnell & leave her a valuable painting. If you can’t control demand, you can control supply. Find eight more vases like the three we already have: destroy them. Since the thieves unionised, fewer and fewer people are shopping in the market. Fortify the picket line to insist that no theft takes place in the square. Hydra Collective sent me a happy copy of Chris Kutalik’s The Misty Isles of the Eld, and while it was excellent to read through, I did at least promise to run it before writing this review. The Misty Isles are a strange location, cut off from influencing the wider realm by the eponymous mists: which themselves make straightforward travel in difficult. The Eld are fascinatingly alien: equal parts biomechanist, bureacrat, and Ziggy Stardust era Bowie. Beaches of black sand give way to a dull alkali plain split only by enormous immobile grubs, peppered with strange and peculiar locations. The isles have history, opportunity, and bodyhorror. The map itself is self-described as a “pointcrawl”, which makes it straightfoward enough to run. No need to track players’ precise locations and instead travel sections can be folded into absurd montages. Dotted about the map are various dungeon locations of sundry size but consistent innovation: these aren’t standard five-room dungeons populated with clichés from a Monster Manual. But for me, the most interesting aspects are the ways that Kutalik has built in ways to make the Isles and the Eld respond to the players’ incursion: he’s constructed Eld Alert patterns that detail the response of the various NPCs and their structures; he’s constructed an Anti-Chaos Index that details the lessening influence the Eld have on the plain itself. While we had a long session, we didn’t get to the more extreme ends of these scales, though their use was easy to implement at the table. How would I recommend you use it? The module is full to the brim of interesting elements whose alien natures mean it’s easy to pull parts out of to use alone in your campaign. Likewise, since the Isles themselves are trapped away behind strange weather, you can drop them off any coast in your game. But just using parts of it mean you lose out on some of the excellent parts where the location itself responds to the players’ actions. The Misty Isles of the Eld are a goldmine of strange interaction. And until the eleventh of June, they are part of DriveThruRPG’s OSR Extravaganza so you can pick it up for 15% cheaper. When the party return to civilisation, much relief can be sought in the daily tide of the town square. Roll 2d6. Each dice value determines a minor event happening; if doubles are scored, instead it’s a significant event. Driven by the Western edge. Driven by the Eastern edge. Driven by the Northern edge. Driven by the Southern edge. Something adjacent to prior or potential plot. The square ends at a low harbour wall with a vista of the wide ocean. The horizon dances with the rumble of a low storm. Minor events: Divers stand on the harbour wall, auctioning pearls and rare fish they have caught. Significant events: The tide itself is very far out. Crabs flounder in the exposed mud. A wide canal is flanked by careful paving stones. The water is shallow but murky. Minor events: Children stood beside the canal are lowering lures into the water to catch crabs. Significant events: A noted nobleman’s boat is at anchor. Edged by carefully clipped hedges, a humble civic garden is open to the public during the day. Minor events: There are flower-sellers in the square. Significant events: At the garden gate, a pair of young lovers are trying to keep their argument from attracting attention. A miscellany of shops offering hot and alcoholic beverages. On windless days, tables fill this edge of the square. Minor events: The centre of the square is taken up by the mixing aromas of various hot food stalls. Significant events: In a corner of the square is an elaborate puppet theatre. Shops selling sundry goods flaunt their wares to passers-by. At least one of these stores is storied and people travel from nearby towns to peruse its stock. Minor events: The regular market extends its hours well into the evening. Significant events: The market is especially busy and boisterous. Local law enforcement is present, but there seems to be no alarm. An elaborate church-front is adorned with symbols of the absent god. Minor events: In a corner of the square, a street preacher addresses a small crowd. Significant events: In the centre of the square, there is a gathering of ageing scholars. Their debate can be easily mistaken for argument. A sombre celebration of heroic achievement, ringed by shattered shells. Minor events: In a corner of the square, a dungeon-diver is telling stories of the dangers they have faced. Significant events: In front of the monument is a group of children. Their teacher is explaining the cultural significance of the monument. Brutal in their simplicity, these civic offices serve both function and focus for town decisions. Minor events: A small team of cleaners are sweeping the city square. Significant events: There is a swelling crowd gathering here to protest. A paperwight is a hellish ambulatory waspnest given sentience by necromantic magic and powered by a burning hatred for the living. Paperwights cause life drain on successful attacks: the wounded player loses xp equal to 100 x the damage caused. When a paperwight successfully drains life, its life total increases by 7. The target’s flesh desiccates and becomes papery beneath its skin; creatures that die this way become lifeless husks. At the cost of one of its attacks each round, the paperwight can animate and control all husks within 50′. Husks are dormant unless a nearby paperwight animates them. Husks have a withering strike on successful attacks: the wounded player loses 100xp. The target’s flesh desiccates and becomes papery beneath its skin; creatures that die this way become additional husks. Hook: Mercenaries that have been guarding araback caravans have reported there has been a complete halting of gobling attacks at Hanover Pass. 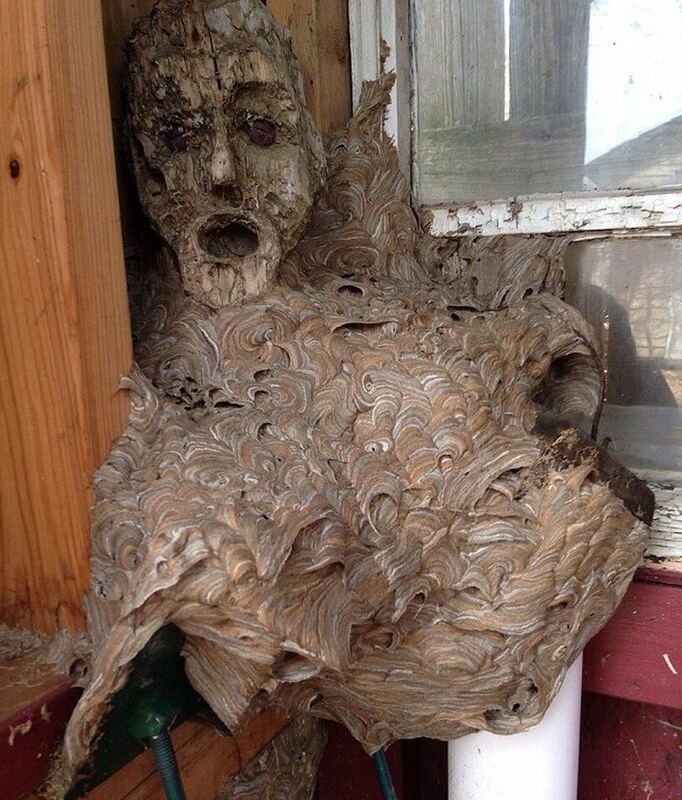 Truth: The goblings attempted to fumigate a hornet’s nest by blasting it with necrotic energy; the resultant paperwight destroyed the entire colony. Anyone with clerical sensitivity will immediately note an aura of undeath at the site. The PC with the highest WIS will notice the silence of no birdsong. The gobling caves exist at the top of a cliff: there are small handholds that create a tiny ladder to ascend. This untidy room is decorated as though a ritual has recently taken place here. A large space dedicated to sundry aspects of gobling life: food preparation, bedding, relaxation. The room is entirely edged with gobling corpses (as many husks as ten times the number of PCs). A fairly small room is made more cramped still by a network of shelves, replete with bows, spears, shields, javelins, spears, &c.
The corridors between the weapon racks are thin, placed for the slighter goblings. Moving unimpeded between them will require DEX checks. A tight stairwell leads to an otherwise inaccessible plateau at the top of the canyon. The conditions here are perfect for growing rare herbs which will be worth many shells. So, EXUVIAE has been up for two weeks on Kickstarter, happily having hit 156% of its initial target. We’ve passed one stretch goal already, so have almost half a dozen cocktails inspired by the game going into the final book, and we’re edging towards a point where we’ll be able to share the short film that Tom Thornton and I are working on with all of the backers. If you’ve yet to back EXUVIAE and love playing investigative RPGs but lack the time to develop sufficiently interesting stories, then EXUVIAE is the game for you. You’ve even a couple of weeks to try out the game by backing a single pound before deciding how much you want to invest. Have you played EXUVIAE yet? I’d love to hear how your games went in the comments!